gender issues in science | Science, I Choose You! We need workplaces that support women with families. Which means we need workplaces that expect men to do their fair share of parenting. @TheresaLiao Right, Genuine change will only occur when it’s framed as a parental issue. B/c the answer must require dads being parental. Conversations like this usually get me down the rabbit hole of thinking about women & careers. I started to remember a feature by CBC Doc Zone, The Motherload (free online access for Canadian viewers). @TheresaLiao What happens in the first months of parenthood sets the template for parental responsibilities. Too many dads opt out early on. @hormiga @TheresaLiao SPOT on. First 2-3 months - hardest to cope with - most important for bonding. I don't regret a second of it. @TheresaLiao Dads get affirmation from peers when they let the moms take on an unfair burden. Women get judged if they aren’t doing enough. @hormiga And I think some moms feel guilty if they do not take it on, considering that is the standard "model" of parenting. @TheresaLiao All the dads have to do, is to do as much as the moms. Unfortunately, that’s not common enough. @hormiga Yeah so true. And the pressure could be from both genders. Terry talks about this more extensively on his blog post, On gender, parenting and academic careers. A very good blog post, please take some time to read it. Some 51% of respondents said that children are better off if their mother is at home, while 34% said they are just as well off with a working mother. And, in a separate question, they were asked about fathers and their children. Only 8% of all adults said that children are better off if their father is home and doesn’t hold a job, while 76% said children are just as well off if their father works. Also, if we look at stay-at-home moms with a college degree, 88% of them have working husbands. This is the group that likely have a better chance of finding a job, and probably with less financial burden, yet why their husbands are the working ones, but not they, is curious (get paid less? cannot find jobs? social pressure to stay at home and care for kids? truly want to stay at home? probably worthy another analysis?). Reading the report, it is not difficult to see how complicated the issue is when you consider marital status, income level, education level, etc etc (hence, more than a gender issue…). So now the question – how can we tackle this issue? @TheresaLiao We do need better workplace policies and $ for parenting. But the inequity will persist as long as dads fail to do their share. Agreed. And I think conversations including both genders are very important. @TheresaLiao Thanks. Like most, I feel poorly equipped to deal with the gender inequities in science and academia. More talk is important. Now about having conversations re: women & careers and women in STEM. My personal experience chatting with some male colleagues and friends is that because discussions on these topics usually end up very heated (their impressions are that pretty much anything they said could be considered against women’s rights, or that they don’t understand the issues because they are not women), they would rather avoid conversations about any gender-related issue all together. And, many of these conversations happen in female-dominant meetings, where males are the minority. This could be very uncomfortable for male participants. At one of such meetings that I happened to be at, one presenter made a wiener joke – and I don’t even want to imagine how uncomfortable the two male students in attendance felt (Funny how that we are trying to increase the number of women in STEM, yet we created another minority in the discussion of women in STEM). This is a huge problem for two reasons. 1. There is no way to know how to better change policy if we only have half of the opinions in the room. 2. Many of those in decision-making roles are still male, and without some buy-in and participation from them, gender-related discussions often reflect to actual changes very, very slowly. How can we change this? I think more people are aware of the lack of males in discussions regarding women in STEM. For example, in the Women Poised for Discovery and Innovation: Resolving the Remaining Hurdles session (see my Storify of the session) during American Association for the Advancement of Science Annual Meeting, less than 5% of the session attendees are male, and people started to tweet about it right away. But, perhaps there is more we can do about this. How can we frame this so that it is more than a women’s issue, but something that everyone should participate in the discussion for? Even men in STEM have mothers, daughters, other colleagues they can relate to? What do our male colleagues think of these issues and are they aware these issues could bring instability into the academic environments as a whole? After all, a healthy academic environment must be good for everyone? This is part 4 and the final part of my series on how gender bias in science is studied. In the past few weeks, I summarized how gender bias in science has been studied: through surveys and interviews (Part 1), through existing data (Part 2), and through experimentation (Part 3). What we have learned is that there is evidence to support gender bias in science, most objectively through experimentation. Now the tough question – what do we do now? And I certainly hope that it doesn’t involve turning the physics department pink. 1. First, let’s start by changing the process of job and scholarship application review. Bias during reviews of job/scholarship applications and interviews is nothing new, and definitely not limited to gender and science. A study from 1997 showed that blind auditioning of musicians for symphony orchestras resulted in a significant increase in the percentage of women advancing into the next round, as well as being selected as a winner in the end. Additional research supports the use of anonymous job application procedures to ensure that the job application review process is less biased against women. These provide established cases for modifying the current process of hiring and award evaluation in research and academia. While it might be difficult to introduce an anonymous/blinded process at the faculty-hiring level (it is not difficult to guess who the researcher is given one’s work experience and publication record), it is very doable at the early career level. I think because the potential implication can be very significant, this should be implemented as soon as possible, with experimental conditions set up so that we can actually see if anonymous application processes can actually improve the hiring of women into positions in science, as suggested by my friend Artem. On top of this, I agree with the suggestion by the Moss-Racusina et al paper reviewed previously, that the policy for hiring should be specific and the process should be transparent. 2. We have discussed the role of implicit bias in my previous post. Can we actually reduce or eliminate implicit bias? Researchers in the US found that in the case of race, implicit bias is malleable. In an industrial setting, there are firms that provide strategies to address work place bias. Whether or not such a strategy is effective should be further evaluated, as noted by Bendick and Nune, but it is worth considering. It looks like the European Research Council will be introducing unconscious bias training for award selection panels; I am hoping that this will set itself as a good example for future academic hiring and award evaluation. 3. There needs to be some major structural changes with regards to how academic research and tenureship appointment works. For the past hundreds of years, it has been assumed that academic careers are taken up by men who do not need to make time for their families, and who are comfortable with leaving their families behind to advance their careers. This is unfair for both men and women, and creates a hostile environment toward women and pregnancy. And believe me, students are already thinking about the bad rep of an academic career when they are in undergrad. Just check out this question by a student during UBC Science’s 50th Anniversary Lecture – Science: The Gender Dimension. No one is claiming that juggling a career in physics while raising children is easy. But having a family while establishing a career as a doctor or a lawyer isn’t exactly easy either, and that doesn’t prevent women from pursuing those callings. The chance is that, it is more than providing child care services or parental leave, but also about whether people in academia welcome such practice. We have had a bad rep for long enough – changes in the system could provide a positive view of academic careers as a whole for female students who are just starting their academic career. While I understand the motive for these two strategies, my fear is that we are simply reinforcing existing gender stereotypes. Last year, research by Betz and Sekaquaptewa actually suggested how feminine models could turn young girls away from science. I hope to see more studies such as this to to tease one which strategy works, and which one doesn’t. 5. Last but not the least, we all need to change our attitudes toward success. Being a woman in science can be a double-edge sword: If you are not aggressive and successful, people think that it is your fault and your decision to not stay in science. But if you are ambitious and aggressive, people think that you are not approachable and intimidating and event not good for the job (see Competent Yet Out in The Cold: Shifting Criteria for Hiring Reflect Backlash toward Agentic Women by Phelan et al.). It also looks like we women hesitate to promote either ourselves, or promote other women. Furthermore, some women become “non-feminine” in order to feel they belong in a male dominant field, as suggested by Pronin, Steele, and Ross in their article, Identity bifurcation in response to stereotype threat: Women and mathematics. This recent ad from Pantene, albeit a commercial ad, pretty much sums up the problem. One possibility is that…when stereotypes of women become salient, women tend to incorporate those stereotypical traits into their current self-perception. They may then find it harder to imagine themselves as, say, a mechanical engineer. As women, we need to realize that some of this responsibility does fall on our shoulders, that we should be more supportive of our successful colleagues (and sometimes the difficult decisions they made), and push ourselves further even though there is a risk and we might not win. If we all just sit back and do what is expected of us, the future of women in science will not change for the better. Here are a few other posts/resources to check out. I am also including a list of research references I used in the post at the very end. There is a podcast based on this series in the plan, so look out for that in the future! The Delusions of Gender, written by Cordelia Fine, is a great book. It shows that our psyche can play tricks on us, regardless of how our conscious minds would like us to think. I highly recommend it. Athene Donald is a Physics Professor at Cambridge. 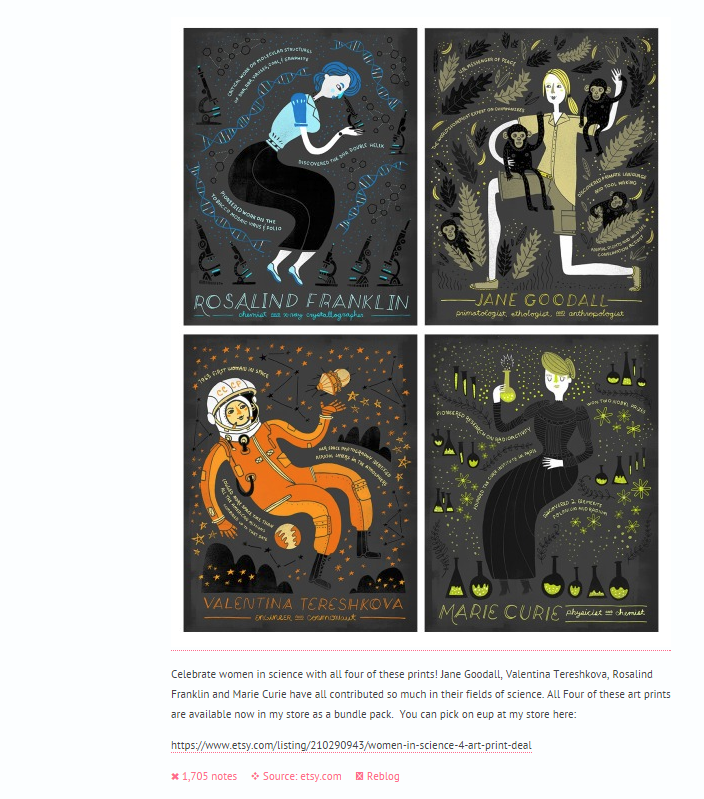 She writes extensively about gender issues in science on her blog. Why So Few? Women in Science, Technology, Engineering and Mathematics is a resource developed by the The American Association of University Women. Extremely long, but very thorough. The Advancement of Women in Science and Engineering in Women in the Chemical Workforce: A Workshop Report to the Chemical Sciences Roundtable. Free book chapter via the US National Center for Biotechnology Information. Why more women aren’t becoming engineers by Jennifer Meyers. 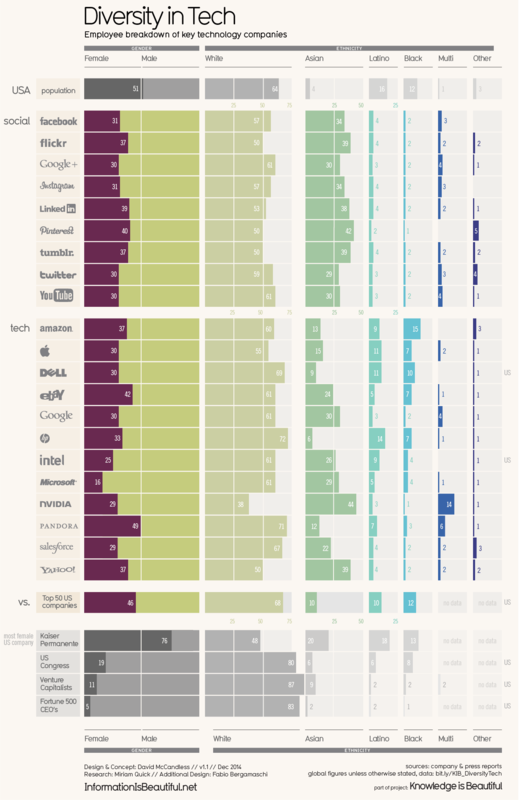 Very interesting statistics at the end of the article. More Women in Science policy forum published in the Science Magazine in 2005. Subscription required. Nature Special – Women in Science from earlier this year. Subscription might be required. 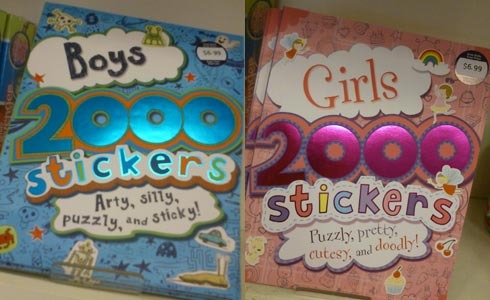 I passed by these sticker books in Chapters some time in the summer, and the idea of them upset me. Check out the product description and photos of these sticker books (close the pop-up and scroll down). It seems that I am not the only one uncomfortable with the gender stereotype that boys should play with insects and go camping, and girls should write poetry and act on stage. Check out this blog posts: This isn’t just any children’s sticker book…this is a sexist M&S sticker book by Meg Pickard. Read Melissa Carr’s post Why New Pink Kinder Surprise Pisses Me Off, and also the post Why do parents buy into gender segregated toys? by Reel Girl. And that is why while I know that something like Goldieblox, engineering toys for girls, would be popular, and that a swarm of parents would go for it, something doesn’t sit right with me. In one of the workshops that I was involved in running, girls had so much fun playing with circuit boards and wires and lasers (they were building a laser detector) – none of the parts were coloured pink and made with ribbons. They were the exact same electronic parts that we used for workshops with boys. Read Spydergrrl’s post Why I Won’t Be Buying Gender-Segregating Toys Like Goldieblox and Lego Friends. (Updated Nov 18, 2013) And definitely read about Jamie Davis Smith’s personal experience in Getting Over Goldie Blox. I should mention that I grew up loving both Lego bricks and Barbie dolls. My parents never told me to play with one or the other. And my Lego bricks were not in pink.